THE world’s most expensive footballer has chosen the Costa del Sol to recover from a tiring season for Real Madrid. Welshman Gareth Bale has been spending some down-time with friends in and around Marbella. 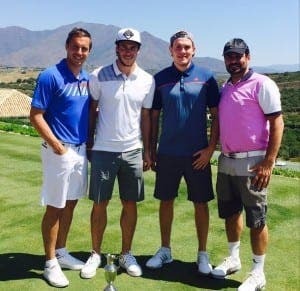 His pal Everton defender Phil Jagielka joined him for a round of golf at Finca Cortesin in Casares, rated the second best course in Spain. Bale, who cost Real Madrid 100 million euros two years ago, is rumoured to be partying in Sisu Boutique Hotel over the weekend. He has been a controversial figure this season, drawing criticism from Madrid’s fans despite scoring 13 times in the league.